Spring has sprung. And we are enjoying it where there’s actually a spring full of flowers to enjoy. And speaking of flowers, how do you like these beautiful Dominican Cake Cupcakes? These cupcakes are made with the same batter from our Dominican Cake recipe, filled with strawberry jam (because spring!) and covered in Suspiro (Royal Icing). For the last few days my family and I have been in Europe, Denmark more specifically, as we visit relatives and catch up with what’s new since our last visit. Although May is not our time of choice to visit (still a bit too cold for our taste), at least we got here in time to see Spring arriving in full force. It’s a lovely sight. We are only staying here for less than two weeks, as work and school would not allow us to stay longer this time, so we are trying to make the most of our short stay, from getting our daughter to spend as much time as possible with her family, to packing loads of activities into these 10 days. Yesterday we visited Legoland, which my daughter had been dreaming of for a long time. We had decided to postpone the visit until she was old enough to enjoy it and remember it, I have to say that it was money well-spent. She had a blast, and so did we. Kids grow so fast and these times are so precious. And about the cupcakes: be forewarned that this is not really a recipe. I just decided to see if the Dominican cake could be served as cupcakes. To make the cake batter, filling and icing please refer to the recipe for Dominican cake. These post just shows some things that I found useful in adapting the Dominican Cake to a cupcake “format”. 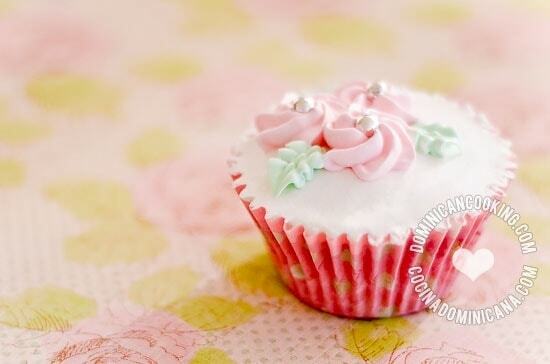 The decoration for the cupcakes is fairly simple – as I’m not an expert. On a base of suspiro (Italian meringue) I put a few pink royal icing flowers with edible silver pearls as center and some green royal icing leaves. If you are interested in learning how to decorate cupcakes I recommend the Wilton manuals, they are excellent for beginners. If you are into baking I also recommend this decorating kit, which I have. It is full of very useful tools. I made these for a friend on her birthday, so I added a little flag made from scrapbooking paper and a bamboo skewer to write a note to her. 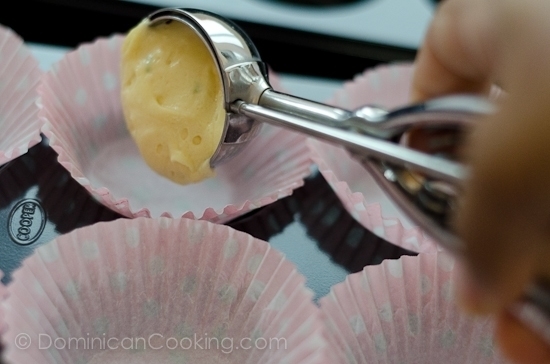 Cupcakes are a great way for beginners to make a Dominican-style cake without much fuss. Buy some beautiful paper wrappers and even ready-made decoration and you will be done in no time. Dominican Bizcocho Cupcakes: I wanted to see if Dominican cake could be served as cupcakes and the result couldn't have worked any better. They are so cute! To fill the paper cups I used an ice cream scoop, it makes for cupcakes of homogenous size and makes it easier to pour the batter without making a mess. These are some of the paper cups already filled. 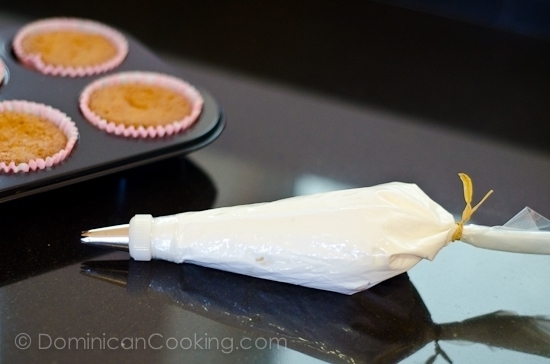 With the amounts in the recipe for Dominican cake you should obtain about 3 dozen cupcakes. Pour 1 tablespoon of preserve on the center of the batter. Heat oven to 300 ºF. 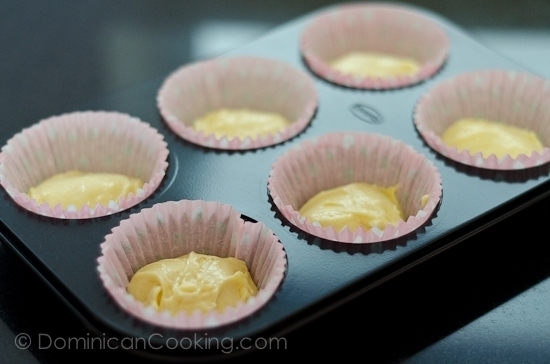 Bake the cupcakes until they turn golden brown (about 20 mins). Here are the cupcakes at room temperature and ready to be decorated. As you can see they do not rise above the paper cup border, this was done on purpose as I wanted a flat surface to decorate. I covered the cupcakes with a flat layer of meringue. To smooth out the surface I used a mini offset spatula that comes with the kit mentioned above. Then I decorated with flowers colored with the coloring that comes with the set and decorating tips and bags from the same. Instead of the traditional pineapple filling I used strawberry preserve for the cupcakes (I bought the preserve at the supermarket). Just make sure you buy the ones with whole strawberries. I poured a teaspoon of preserve (half a strawberry) in each cup. As the batter rises in the oven the preserve sinks and the whole cupcake is infused with its flavor. I’m wondering if I could cut the recipe in half to make less cupcakes? I haven’t tested it with these changes. You can experiment and see if it works. How do I convert lbs to cups so I can measure my butter correctly? Pounds and cups measure different things, one weight, the other volume. There’s no exact equivalency. Baking requires sometimes very exact measuring, which is a problem when measuring dry volumes. I suggest you buy an inexpensive scale, it’ll come handy many times. I tried these and they fell off the paper what did I do wrong??? What do you mean “fell off the paper”? Didn’t you put the paper in a cupcake mold? 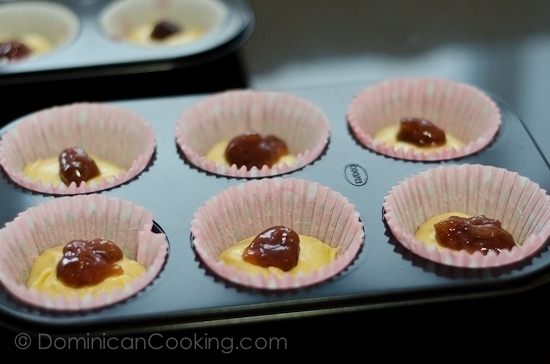 For the cupcakes – can I add a dulce de leche filling or a custard filling instead of the pineapple or strawberry? Can it be baked in as you did with these? I am not sure how it would work since I didn’t test that. Perhaps you’d be willing to conduct your own experiment and report back? hi! i just want to know for how many minutes are the cupcakes suppose to be baked for? and how many cupcakes do the mixture makes.